Because this social media platform has dubbed itself, the “professional social networking site,” it has gained significant ground with professional industries. As a result, LinkedIn has become an important piece of the social media puzzle. LinkedIn provides its users with the opportunity to connect online with colleagues and business associates, as well as potential clients and connections. Today I want to provide you with three tips to brand yourself on LinkedIn. While this may seem like an obvious point, uploading a professional (and current!) profile picture is important. Users connecting with you want to ensure they are connecting with the right person. Think about the last time you were at a Kingston Chamber of Commerce Mixer when you met 20 new people. Now try to remember what they looked like. Tough, eh? Including a picture on your profile will instill confidence in users wanting to connect with you – that the profile they are viewing is connected to you. a. Helping clients find solutions to manufacturing problems. b. Strong track record of building great organizations. c. Connecting local business with local talent. d. Training people how to be more effective on Microsoft Office. The field marked “Current Position” is your opportunity to shine, and explain to the world what you do! Focus on what you do for clients (e.g. reduce office inefficiencies, solve workplace conflict, increase sales, or reduce workplace stress). Once you’ve wrapped up, include contact information via phone email, so that it is easy for people to contact you! Good luck! Click if you want to connect with me, or view my LinkedIn profile. I’ve had lots of interest from people looking for more information on Facebook advertising. One of the biggest stumbling blocks is that of Facebook advertising language. I’ve done you a favour and compiled a list of the common Facebook ad words. 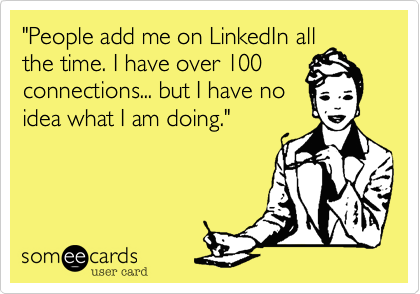 I’ve published blogs addressing too many emails from Facebook and LinkedIn. Today I am going to remedy the problem of too many emails from Twitter. Did you wake up this morning to find 12 emails from Twitter about tweets that were retweeted, and favourited? Perhaps you received 9 emails about tweets in which your account was mentioned or replied. There are currently 5 different types of emails that you could be getting – and they all relate to your Twitter activity. 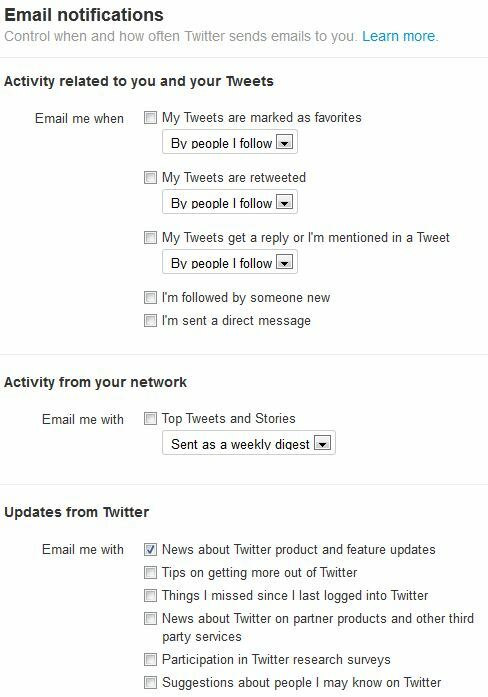 In addition you could be receiving emails about your network’s activity, as well as generic updates from Twitter. Let’s clean out your inbox. 4. From the list provided, select the types of emails you wish to receive. Note: If you don’t want any, unselect all the tick boxes. 5. You’re done! We’ve cleaned up your inbox, and hopefully made emails from Twitter more manageable. The individually typically goes on to explain that they are busy, and don’t have time to respond to 43 new emails every day from the previously mentioned social media site. As a result, those 43 new emails end up in the user’s email trash… without ever being opened. 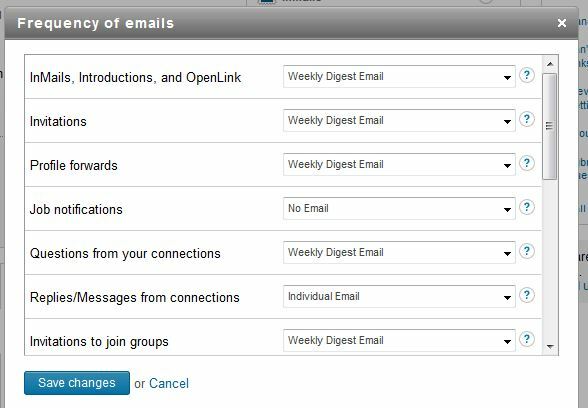 Today I am going to discuss LinkedIn’s email settings. When you sign up for a LinkedIn account, you are automatically signed up to receive a notification each time a connection does so much as hiccup. You’re in luck because this can be changed. 5. 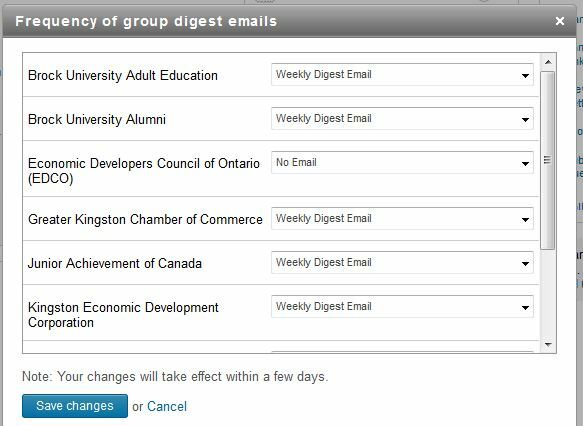 Customize and choose the emails you wish to receive from LinkedIn. 6. Save. Close that window. 9. Save. Close that window. In my last blog post I discussed the facts of social media. I have to admit that the most impressive statistic is the one billion users on Facebook. While the Facebook Newsroom/Press Release section of their website confirms this number, I have my reservations about this factual information. As an aside, it also makes me think of this movie clip from the Austin Powers series. Although Facebook’s policy clearly states that personal profiles are to only be used by individual people, there are many individuals who have set-up their business as a personal profile. When I click “Find Friends” in Facebook, I am bombarded with companies and not people. If you’re a company, it’s guaranteed I will not click +Add Friend. On this topic, I wanted to highlight a few elements that business may want to consider when developing a presence on Facebook. First, there is less functionality in a personal profile than in a page. 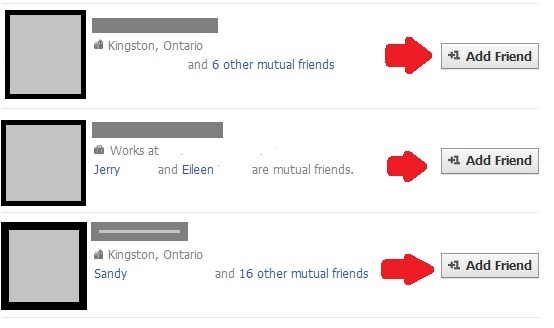 Personal profiles are limited to 5,000 “friends” as opposed to unlimited “fans” in a Facebook page. 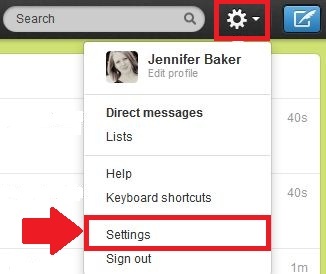 Pages also have access to a greater number of applications that customize a user’s Facebook Page experience. Second, many users do not want a company to gain access to personal information that is meant exclusively to friends. Businesses are not privy to my personal information and photos. While Mark Zuckerberg claims they have surpassed 1 billion users, I have my reservations. Facebook is currently working on “cleaning-up” fake accounts so as to provide more accurate numbers. I am looking forward to updated statistics soon… even if they are much less than a billion. Remember 500 million active “real” accounts are better than 1 billion fake accounts.